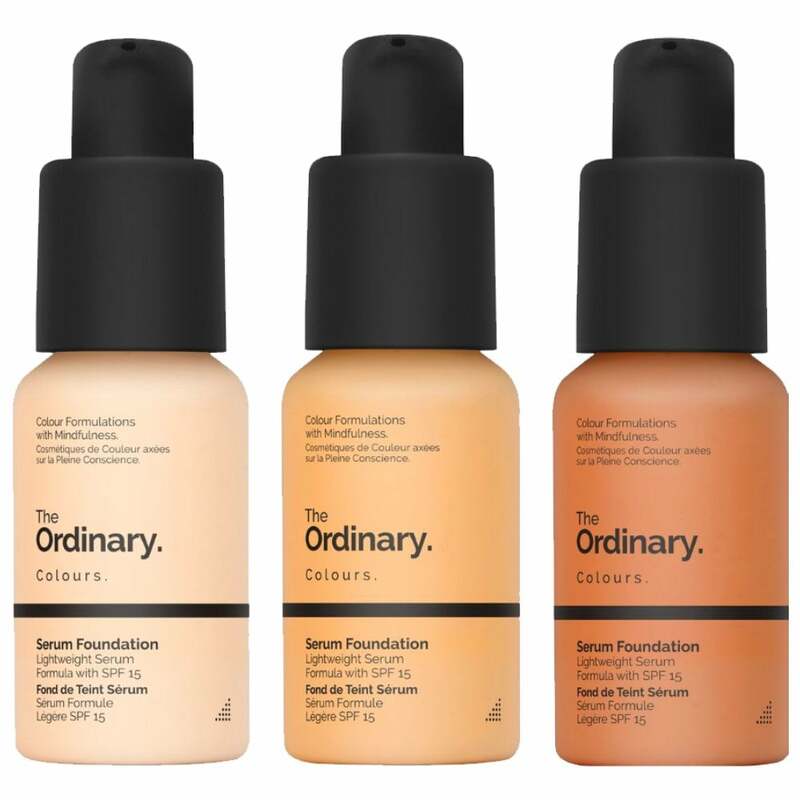 The Ordinary Serum Foundation SPF15 (30ml) is a lightweight serum foundation, providing medium coverage with SPF15 sun protection. With a blend of premium colour pigments contained within The Ordinary’s unique spreadability system, the foundation produces a natural, smooth, semi-matte result which will not cake or be drawn into expression lines. Providing a selection of 21 versatile shades ranging from very fair to very deep, each colour is further classified according to its undertone, ensuring a perfect match for your skin tone. Alcohol, oil, nut & gluten-free. Cruelty-free & vegan-friendly. Very Fair 1.0P - for very fair skin with pink undertones. Very Fair 1.0N - for very fair, neutral skin. Very Fair 1.0NS - for very fair skin with silver undertones. Fair 1.1P - for fair skin with pink undertones. Fair 1.1N - for fair, neutral skin. Light 1.2N - for light, neutral skin. Light 1.2P - for light skin with pink undertones. Light 1.2Y - for light skin with yellow undertones. Light 1.2YG - for light skin with yellow undertones plus gold highlights. Light Medium 2.0P - for light to medium skin with pink undertones. Light Medium 2.0N - for light to medium, neutral skin. Light Medium 2.0YG - for light to medium skin with yellow undertones plus gold highlights. Medium 2.1P - for medium skin with pink undertones. Medium 2.1Y - for medium skin with yellow undertones. Medium Dark 3.0R - for medium to dark skin with red undertones. Medium Dark 3.0Y - for medium to dark skin with yellow undertones. Dark 3.1R - for dark skin with red undertones. Dark 3.1Y - for dark skin with yellow undertones. Deep 3.2N - for deep, neutral skin. Deep 3.2R - for deep skin with red undertones. Very Deep 3.3N - for very deep, neutral skin. Review Summary - 4.5 out of 5 based on 41 ratings. I love this foundation. I got the 3.1Y and it’s a perfect match. For reference, I’ve got dry skin and my Fenty Beauty foundation shade is 390 and Black Up full coverage 06. It’s great for everyday wear- just the right amount of coverage- medium. The colour was slightly darker than expected, however I was OK with that. The problem is that this doesn't stay put on your face and is pretty heavy for a natural look. By the end of the day it looked patchy and my face felt greasy and was shiny with oil. I have purchased a few great things from the ordinary, however this is not one of them. Can't believe how rubbish it is. Lovely prduct. Excellent service also. Great colour choice and match for my skin tone. Really pleased with level of coverage but dries really quickly and sticks to my dry skin leaving me looking patchy. Making it work though putting it over my usual foundation for extra coverage. Also lovely feeling when being applied. Be great for someone with normal to oily skin. Despite trying to research the best shade for me it's still not right. I think though with perhaps the lighter shade to this it would be ok.
Love this used Elizabeth Arden foundation always before trying after reading about it tried 2 shades and absolutely surprisingly loved 2yg with yellow tones they have not sent me the right shade it looks lighter from the outside of bottle 1.2yg a bit disappointed but we will see. I have been using it for a few days, previously on Clinique anti blemish foundation. So far this product works really well, gives you sufficient cover but still looks very natural and no spots. Stays put for most of the day when other makeup would need to be blotted or reapplied after a couple of hours. Good coverage and colour, lightweight. I have oily skin and using this over The Originals azaliac acid with a small amount of finishing powder leaves my skin oil free most of the day. The shade is perfect - I bought 1.0N as it's the closest colour match to NC15 by MAC. It's light - I use a powder to set it, but read bad things about the coverage foundation. Unfortunately I’m not impressed by this foundation. - found it really watery and the colour was awful - really orange and unnatural looking . Really like this, difficult to get the shade right online but applies easily and gives a nice coverage. Bought the 2.0P, as I thought it was suitable for skin with pink undertone, but not sure now if product description meant the serum has pink undertones. My skin has a medium red tone, but not rosacea. My skin is medium, not overly light/fair. This makeup is still suitable for my skin, although next time would try the 2.0Y or 2.0N. And yes there will be a next time. I am 66 years old, and have always looked after my skin, especially as lived in Australia for 25 years. So I don't have wrinkles to speak off, but creases more where my skin is older, and dropped!! This makeup sits very well on my skin. Tried it with just moisturiser, and also again today with moisturiser and primer. For me it has a few positives. The applicator is lockable. I don't need primer. It applies without use of brushes or sponges. Has staying power. Good base for lipstick. Ideal to take away on holidays, as it can be used without needing anything with it i.e: brushes etc, although would still use moisturiser under it at my age. I am vegan too, and finding "Just my Look", has been brilliant. Lots of choice, will definitely shop here again. Bought this because I heard people raving about it.I am very pleased with coverage and staying power, but found it tricky to get right shade,really need next shade up. Brilliant coverage & excellent value for money. Great product for day wear, and can be built up. Perfect on laugh lines and eye wrinkles. Very lovely ‘no foundation’ feel at a wonderfully low price. Great product at great price. Love it!